Local residents and visitors often stop to admire the unique, fortress-like architecture of The Memorial Church of the Prince of Peace located at the corner of West High and Baltimore Streets. But, many don’t realize that they are also looking at a Civil War Memorial. The Memorial Church of the Prince of Peace, known to many as simply “Prince of Peace Church,” is the only church in Gettysburg constructed to memorialize the Civil War fallen. The church has more than 150 stones and plaques in honor of fallen Union and Confederate soldiers—140 of these tributes form the church’s bell tower foundation. The Prince of Peace’s cornerstone was laid on July 2, 1888, the 25th anniversary of the Battle of Gettysburg, but the construction wasn’t completed until 1900, and the process for bringing the Memorial’s vision to reality was anything but peaceful. The drummer boy was reportedly from Providence, R.I. and, exhausted from marching and sick with fever, asked Mrs. The Memorial Church of the Prince of Peace, known to many as simply “Prince of Peace Church,” is the only church in Gettysburg constructed to memorialize the Civil War fallen. Judge Fisher of York, Pa.—a nurse—to give him a kiss before he died. The boy was tired, sick, scared, and longed for his mother. As the story goes, Mrs. Fisher held him in her arms and kissed him just before he passed away. He was buried near Little Round Top. Three years later his mother came looking for his body, but never found it. Patrons received a picture of the drum with a poem, the Drummer Boy’s history, and Lincoln’s Gettysburg Address. A relic from the battlefield was also sent to each student who gathered the largest amount of money. Several of these tokens still can be viewed in the Church today. Numerous other thank-you gifts were offered in an attempt to encourage donations, but the congregation was never able to reach their financial goal. While they did open their doors, they were a little smaller than anticipated. As you can see in the photo, the projected building and the finished structure vary greatly in size. 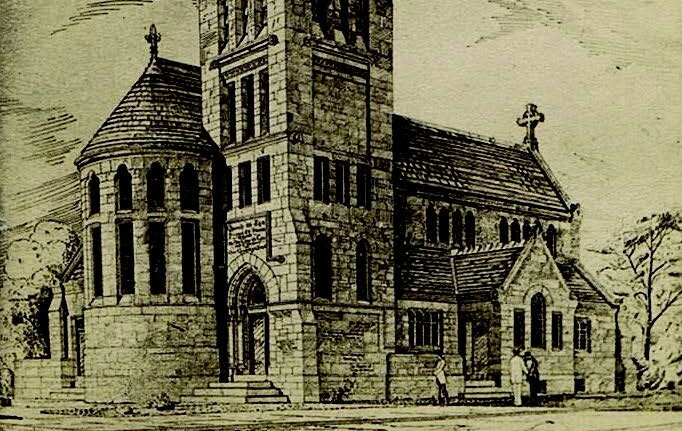 In 1970, a fire nearly destroyed the church. Fortunately, the historic bell tower, including the memorial tablets, survived the blaze. The congregation reconstructed the interior that same year and the church still thrives today.